Can you believe another month has passed? Wow! March zoomed past in the briefest blink of an eye. And because today is the last day of the month, you know what's happening... It's a Mad Hatters' Party! It's week 13 and my current hat count is 17 out of 52 finished and the 18th hat is on the needles. I'd hoped to get a few more hats knit this month but... My diagonal striped blanket has been receiving most of my attention. 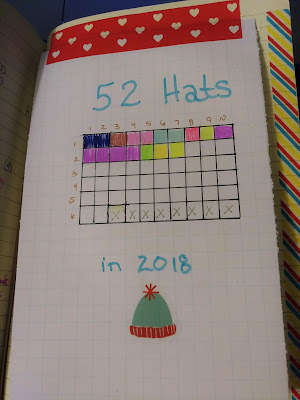 I'm a little, tiny bit worried about meeting the 52 hats knit in a year goal although I know it's way too early to seriously panic. It's just that work will be going full time soon and full time means 60 - 70 hours a week. And instead of the park closing after Halloween, this year's season lasts through December 30th. In other words, my knitting time is about to be Greatly reduced. I'd been on a pretty good schedule of starting a hat on Monday & finishing it by Thursday without much effort but March.... March's hats seemed to drag on and I had to consciously force myself to work on them. The hat knitting is dragging because all I want to do is knit on the blanket. It's such a mindless, relaxing project, I change yarns constantly, and I'm making a pretty good dent in the scrap yarn pile. With all that going for it, I'm finding it extremely difficult to put down the blanket and pick up a hat. But, like I said, I'm not too terribly worried. I made myself a handy tracker and I get to color in a box each time I finish a hat. I do love to color in boxes so I'm still motivated. And no, the box colors have no meaning. I've just been trying to use up some of the 40-gazillion pens that I have laying around. "Finishing" a pen (using it until the ink runs dry) is another weird obsession of mine. Okay, you folks know Way too much about me! Join me over at Maggie's NotAStation blog for today's Mad Hatters' link up party. The progress chart is a great idea - a visual reminder and a quick way to check progress. Great fun to see the hats. Thanks! The tracker really isn't exactly blog mention worthy but it does help keep me motivated. Hats are fast and blankets are slow, but I like both!! Love your progress chart. I have some of the same worries about the hat challenge, but keep telling myself I started this because I thought it would be fun. It's not a job I took or a commitment to someone else. If it's not fun anymore because it's stressing me out I can easily give up. Oddly, seeing all the blanks on the tracker doesn't bother me. The fact that week 14 on the calendar is ending and I still only have 17 blocks colored in ... is a different matter. Yikes!